Start/Finish : Leaving from the village of Værøy, take Route 791 toward the hamlet of Norland. Park, without blocking traffic, near the houses in the curve in the road at the far end of Breivika Bay. In the middle of the curve, a little sign indicates the start of the hike (same starting point as the Gjerdheia hike). Note : A short passage just before the summit is slightly dizzying and should be avoided in humid weather. This hike can be combined with the Gjerdheia summit. Not only is the summit of Nordlandsnupen the highest point on Værøy Island, but we think it’s the most beautiful. 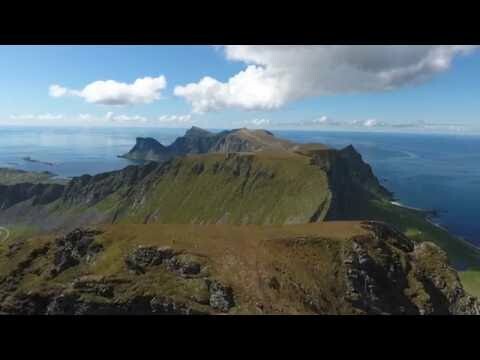 This relatively easy hike will quickly take you to an altitude high enough to give you magnificent views over the island of Mosken as well as over the whole southern tip of Moskenesøya Island. If you only have one day on Værøy and the sky is clear, go for it! In the curve, to the left of the road, you’ll see a sign showing the direction of the Nordlandsnupen summit. Follow the trail, which goes along a scree through a damp meadow. The trail then follows the bottom of the small valley of Breidalen, using an old track which is still paved in spots. At the low points of the valley, you’ll see many walls and stone foundations which bear witness to an time when there must have been more agricultural activity. From the pass at 176 m, it is possible to take a trail on the left to reach the plateau of Gjerdeheia (379 m). From there, you’ll have a fine view of the valley you just climbed as well as the beaches of Nordlandshagen below the cliff on the other side of the pass. To reach the summit of Nordlandsnupen, you need to take the trail that winds along the ridge to your right (northeast) to the first plateau with a high point of 432 m. From this first peak, the view is already superb and you can see the summit of Nordlandsnupen and its cairn perfectly. Next the trail goes down again toward a little pass that separates the plateau from the Nordlandsnupen summit (northwest direction). The path goes along at a slight slant for about twenty meters before it leads up toward the summit again. At this spot, there’s a cable attached to the rock that will help you get through this rather steep passage. Watch out: the passage between the two peaks can be upsetting to people subject to vertigo. If you don’t feel up to going through this passage, bear in mind that the view is practically as beautiful from the first plateau (Breiknupen) as from Nordlandsnupen itself. You go back the same way.